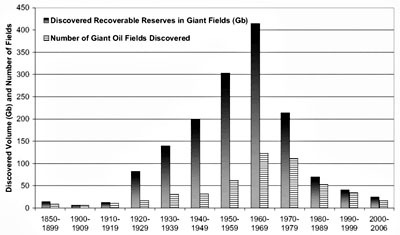 One of the clearest indications that the planet is running out of oil is the fact that discoveries of giant oil fields have slowed so dramatically in the past couple of decades. This new field in the Gulf is supposed to hold 700 million barrels of recoverable oil, which puts it at the low end of the category (a “giant” oil field contains 500 million barrels or more of crude), and these days that counts as a major find. But historically speaking, this is a pipsqueak, and we’re finding damn few fields of even this size. The fact that this is so big a deal is a bad sign for the oil industry.